With Musicnizer you can easily organize your music albums, download covers, album reviews, biographies and discographies of artists, etc. 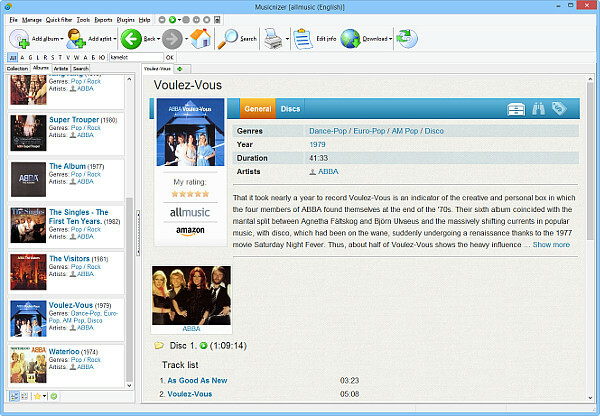 Unlike other music organizers, Musicnizer allows organizing not just audio files and Audio CDs. It is possible to add vinyl albums and other media. You music collection then can be sorted and searched in different ways. Create reports, show statistics, apply various filters to your albums. The program stores information about music albums and artists in its database. This information is displayed in the working areas of the program. On the left, there is a list of albums or artists (depending on the selected tab). On the right, details for the currently selected item are displayed. The output is controlled by user interface scripts. They are special modules that specify not just the design of all pages displayed by Musicnizer but also what information is displayed and in what order. Available scripts are shown on the "User interface" tab of the options menu. There is a list of available user interface scripts. You can click an entry to select the corresponding user interface. Musicnizer will load the new interface immediately. This window can be different for each selected interface, as it controls the particular interface. Show user rating. This shows your own rating (the stars). If you do not rate your albums and artists, you can disable this option to get rid of the stars. Show site ratings. Sites where Musicnizer downloads information from may offer their own ratings of each album. Musicnizer can download and display these ratings. Show logos of codecs and formats. The Breeze interface can display logos of formats on album pages. Always show edition names. 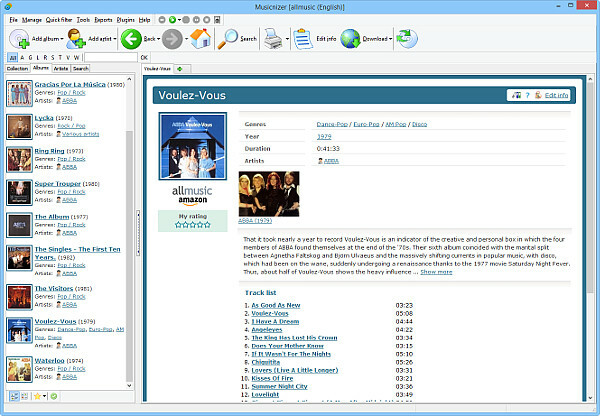 In Musicnizer, you can keep information about several editions of the same album. This is the same as saving information about an album with several CDs. This option shows a header on the album page for each edition / CD, even if there is only one CD for the album. Show info about editions on the main tab. This shows track lists and other details for each CD / edition on the main ("General") page of the album. If you disable this option, these details will be displayed only on the "Discs" tab of the album page. Show only edition's name (without number). By default, the header for each CD includes "Disc 1", "Disc 2", etc. With this option enabled, if your CDs have their own names (like "European Edition"), only the names will be displayed in the header. The "Disc 1" part will be omitted. Fixed width of the contents. With this option, you can choose whether contents of the page should flow around other elements, using the available free space. With the fixed width enabled, free space areas under the album cover on the left and other images on the right will not be used. Show pictures on the album page. Here you can specify how many pictures you want to see on album pages. Pictures are displayed only if they are available for the album. Cover / photo width in the list. This controls size of album covers and photos of artists for the list on the left. This applies to the detailed list mode. Line spacing. You can choose how many free lines should be left between two lines of text. Fewer free lines will condense texts displayed on various pages, showing more information in the same area, but more free lines may look better. Basic font size. This is the reference font size. Breeze uses different font sizes for different elements. Depending on this basic font size, it will calculate necessary values for all elements. Rows of covers on the artist page. If you have many albums of the same artist, their covers will be displayed on the artist's page in addition to the simple discography list. By default, just one row of covers is displayed (if there are more albums, no covers at all will be displayed for the rest), but you can change this using the option. Use thumbnails. Thumbnails are smaller copies of covers and photos available in your database. Using thumbnails allows Musicnizer to show various pages faster, especially if many images are involved. Furthermore, if this option is enabled, quality of displayed images is better. Show only titles and years in the movie list. If enabled, this option turns the detailed list of albums into a very simple list. Last updated instead of last added. This allows showing last updated albums and artists on the home page of Musicnizer. By default, the last added ones are shown. This can be useful for computers with lower resolution displays. Show only collection-related statistics for persons. When you download information about artists, complete discographies may be downloaded. In this case, on the "Persons" tab, Musicnizer shows how many albums each artist has in total. If you enable this option, Musicnizer will show how many albums of the artist you have in your collection instead. On the home page, show albums without covers, too. By default, only albums with covers are displayed on the home page ("Last added", "Last updated", etc.). If you want to see all albums, even if some of them do not have covers, enable this. Hide covers on the artist page and photos on the album page. This hides all album covers on pages of artists and photos of artists on pages of albums. With this option enable, only text entries are displayed. Cover list options. Here you can set size for covers and photos for the cover list mode. There are cover dimensions (actual size of each cover) and cover cell dimensions. The latter values are bigger. A cover cell typically contains a cover and the name of the album. Cover cell dimensions also set the distance between two album covers in the list. Discography settings. These settings specify how discographies will look like. Number of rows for covers per page. Here you can specify how many rows of covers should be displayed on one page. If you click an item like genre, all albums of this genre will be shown. By default, 3 rows of albums are shown on one page. If you have a high-resolution display, you may want to show more rows. Number of rows for photos per page. The same as above, but for photos of artists. Show photos on the artist page. Here you can choose how many additional photos should be displayed on the "General" tab of the artist's page. Photos will be displayed only if available in your database. You can easily reset everything to defaults using the "Defaults" button. To confirm any changes, click the "OK" button. If you do not want to save your changes, just close the window using the close button in the upper right corner of the window.